Al Pacino delivers one of his best performances in recent memory as an aging rock star. It's easy to see why Al Pacino took a shine to this project: It provides the veteran actor with a role that requires him to dial his performance up and down — unlike much of his work over the past couple of decades, in which he always seems to be going at full tilt. Hooah! Arguably, these oppositional qualities are the rightful domain of dramedy, the comedic and dramatic elements of the story vying for laughs and tears, generalities and intimacies. 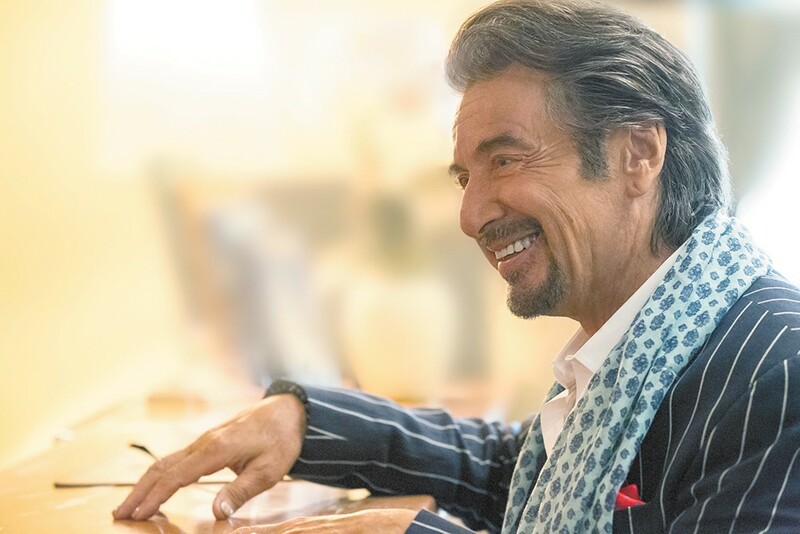 As the titular character in Danny Collins, Pacino delivers his best work in a long time, but it's contained within an utterly predictable redemption story that only comes alive when Pacino plays one-on-one scenes with the other cast members. Danny Collins is an over-the-hill rock star who we meet as his new album Greatest Hits: Vol. 3 is about to drop. He hasn't written a new song in three decades, and the new release and accompanying tour seem calculated to maintain his fabulous home, private plane, young girlfriend and vast quantities of booze and cocaine. Then, out of the blue, the unique birthday gift given to him by his manager and best friend Frank Grubman (Christopher Plummer, who's terrific) causes a crisis of conscience. The gift is a framed letter to Danny from John Lennon, written in 1971 when Danny was just starting out in the music business. Inspired by a true incident that happened to the British folk singer-songwriter Steve Tilston, the movie's conceit is that the former Beatle wrote to Danny after reading an early interview the emerging musician gave to a rock magazine. The letter, which contained Lennon's phone number and an invite to telephone him and Yoko, was sent to the magazine and never forwarded to Danny, eventually falling into the hands of a collector, which is where Frank discovered it. Receiving it more than 40 years late, with no further chance for follow-up, the letter starts Danny thinking about all the ways in which his life might have progressed differently had he received the letter back in '71. Impulsively, Danny cancels his tour and checks into a Hilton in New Jersey with the notion of connecting with the now-adult son he has never known. At this point you might be forgiven for mistaking the film for an extended Hilton commercial. While trying to penetrate the wall his son Tom (Bobby Cannavale) has built up, Danny also tries to seduce hotel manager Mary Sinclair (Annette Bening). The road to redemption is paved with all the usual pitfalls (plus a granddaughter named Hope, in case anyone out there still needs a map). Pacino gets to play a rock star with a large personality and eye-catching wardrobe (several times, he's referred to as "slightly ridiculous") as well as a gentle old soul who's afraid he's missed out on the life he was meant to have. Danny Collins is not showing in any theaters in the area.